Pick Analysis: Shepard wears the same jersey number (3) as his late father, Derrick Shepard, who lettered for the Sooners as a receiver in the 1980s. Despite his slight frame, Shepard's toughness, strong hands, and quick cuts make him the sort of in-space player NFL offensive coordinators want working the middle of the field. Shepard’s production greatly increased from his second-team All-Big 12 2014 season (51 catches, 970 yards, five touchdowns) to his USA Today second-team All-American senior season (86-1,288-11). Published: April 5, 2016 at 04:33 p.m.
Take a look at the college highlights of Oklahoma wide receiver Sterling Shepard. Published: March 13, 2016 at 08:39 p.m.
Watch Oklahoma WR Sterling Shepard work out at the 2016 NFL Scouting Combine. 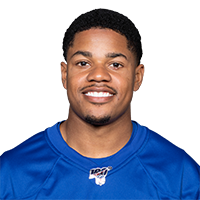 Published: Feb. 26, 2016 at 06:30 p.m.
Former Oklahoma wide receiver Sterling Shepard is a superb route runner and is out to prove he can play at the NFL level.